The Harlem MagicMasters camps are designed to provide a great place for boys and girls to improve their basketball skills, work hard, make friends, and most of all have fun doing it!!! 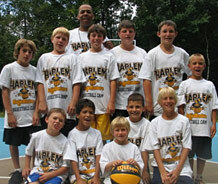 Campers at every Harlem MagicMaster’s Camp will receive instruction to develop all of the basic fundamentals of basketball. Shooting, passing, dribbling, rebounding and defensive drills will be run daily. In Addition Coaches will teach drills to help campers develop their strength, agility, and quickness. We welcome players of all ability levels .We emphasize the “fun” in fundamentals to make each session an enjoyable and memorable experience for every camper. The staff provides constant supervision for all campers. As well as being committed to skill development, and good sportsmanship. Daily Fundamental sessions will establish and reinforce proper form and execution on the court. Each Harlem MagicMasters’ camp immerses the camper into the sport of basketball, by giving them a focused intensive training regimen that is essential to improving their skills, self-confidence and overall appreciation of the game. Camper will learn the commitment necessary to apply an attitude for hard work both on and off the court. Campers leave sessions with a feeling of improvement and self-confidence in the game of basketball. In each camp players receive a functional assessment, instruction in dynamic movement techniques, speed development, vertical jump improvement, and performance nutrition all designed for the basketball athletes daily training regiment. 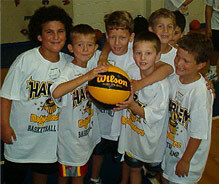 Campers will find the Harlem MagicMasters camps to be the best place to improve their game and have lots of fun!! !